Moon Jae-in was declared the winner 08 May 2017, with just over 40-percent of the vote, and was inaugurated on May 10, 2017. Hong Joon-pyo was 16-percentage points behind at 24-percent, while Ahn Cheol-soo of the People's Party finishing at around 21-percent. Meanwhile, the other main candidates Yoo Seung-min of the Bareun Party received 6.7 percent, and Sim Sang-jung of the Justice Party received 6.1 percent. President Park Geun-hye was expelled from office 10 March 2017 after the Supreme Court ruled she had violated the responsibility to diligently carry out her duty as stipulated in the Constitution. By the end of 2016, eight out of nine survey results by Korea's local dailies show the former main opposition party leader Moon Jae-in earning the highest support among several potential presidential candidates, followed by former UN Secretary-General Ban Ki-moon. Only one of the nine surveys shows Ban ahead of Moon. Behind those two possible contenders were Seongnam city mayor Lee Jae-myung, doctor-turned-software tycoon and former minor opposition party leader Ahn Cheol-soo, the governor of Chungcheongnam-do Ahn Hee-jung, and the current Seoul mayor Park Won-soon. A joint survey by Yonhap News Agency and KBS released in late December 2016 had Moon Jae-in in the lead with 21.2 percent, followed by Ban Ki-moon at 17.2. Seongnam mayor Lee Jae-myung took third place, with single-digit support for Ahn Cheol-soo and Chungcheongnam-do Governor Ahn Hee-jung. A survey conducted by the Chosun Ilbo also showed Moon on top, though by a slightly bigger margin. The other four candidates came in the same order, Ban Ki-moon, again with about 17 percent support. The Donga Ilbo's poll had Moon again in the lead, albeit more narrowly, followed by Ban and Lee. But, interestingly, Prime Minister and current acting President Hwang Kyo-ahn made this poll's top five. Moon Jae-in expressed hope that his party and the minor opposition People’s Party will join forces in the upcoming presidential election. Moon, who was considered a front-runner among potential presidential candidates, made the remarks on 02 January 2017. Moon said the two parties took different paths in last year's general elections, but they were all descendants of the democratic governments of Kim Dae-jung and Roh Moo-hyun. He said that it was the wish of the people and the demand of Jeolla residents that the two parties join hands to reestablish a democratic government. 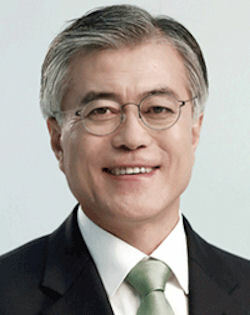 Born January 24, 1953, Moon Jae-in's parents are from Heungnam of South Hamgyeong province, in present-day North Korea. They fled to Geojae-do during the Korean War in 1950. Moon was born a Catholic in Geojae-do and moved to Busan when he was young. He attended middle school and high school in Busan. He was accepted to Kyeonghee University Law School in 1972 but was arrested when he was a university law student protesting in Seoul against President Park’s Yushin constitutional revisions in 1972. He was arrested and expelled from school in 1975 due to participation in student protests. He was forced to serve in the Special Forces to fulfill his military service. He was assigned to the 1st Special Forces Brigade, the commander of which was former president Chun Doo-hwan and the battalion commander was Jang Sae-dong, Chun’s eventual Blue House chief of staff. He returned to school in 1980 but, during ‘Seoul’s Spring’, he was arrested again for violating martial law. However, he was released, miraculously, by passing the bar exam. Moon returned to his hometown of Busan after not being appointed as a judge, and decided to become a lawyer. And at this moment in time he met Noh Moo-hyun. During the 1980‘s, Joint Law Officer of Noh Moo-hyun and Moon Jae-in was handling nearly all of the cases related to labor and human rights in the Busan area. During the June Democracy Movement of 1987, Headquarter of National Movement for Achieving Democratic Constitution was first organized in Busan, before it was formed in Seoul. The head of Busan Headquarters was Noh Moo-hyun and the senior member was Moon Jae-in. In 1988, lawyer Roh Moo-hyun was elected to the National Assembly, but lawyer Moon Jae-in was left alone in Busan to handle cases related to labor rights and current state affairs. Moon did not have much of a role during the 2002 Democratic Party Elections. Only after Roh Moo-hyun became president did he come into the Blue House and become the most influential person. After 2002 presidential election had ended, in January of 2003, president-elect Roh Moo-hyun said to Moon Jae-in and Lee Ho-cheol, one of Roh’s secretaries. Moon failed to stop scandals involving family members of former President Roh. It is impossible to make a political justification as it ended in a death of the former president. As Roh’s last chief of staff, Moon Jae-in was the standard bearer of the Old Guard, Roh-era liberal politics. Roh is famous for implementing a policy of relatively unconditional engagement with North Korea (the Sunshine Policy) and questioning the functional value of the US-ROK Alliance at the most fundamental levels. Moon went a step further during the by-election held on April 20, 2011, by actively participating in election campaigns across the country, and he was a popular guest. He wasn‘t the most charismatic speaker but his openness was appealing to voters. The opposition won the Seoul mayoral by-election, but was soundly defeated in Busan’s eastern district. Moon Jae-In was the central figure leading the effort toward unifying South Korea’s political opposition. He will be making crucial decisions with former Prime Minister Lee Hae-Chan, among others. Chairman Moon also conducted special sessions for members of the Democratic Party. He is also giving readings of his autobiography ‘Destiny of Moon Jae-in’ in large cities such as Seoul, Busan, Gwangju, Daegu, Chunchon, and Daejeon. He attended a talk show at the University of Busan, conducted by Kim Jae-Dong, as a special guest. Moon ran against President Park in 2012, losing by a few points. By November 2012 aides to Moon Jae-in and Ahn Cheol-soo were working round the clock to unify the two campaigns -- a process the two candidates promised will be nice and peaceful. A poll by Real Meter showed Ahn leads Park 47-percent to 42-percent in a hypothetical two-way race. In a two-way competition between Moon and Park, Park had 46-percent support with Moon trailing with 45-percent. On 13 November 2012 the two campaigns took the first step toward the unification process with the completion of a draft of their joint declaration on political reform. The declaration contains a set of political reform plans that Moon and Ahn agree to implement if one of them becomes president -- such as reducing the president's power of appointment and increasing the number of proportional representatives in parliament. The breakthrough came after campaign staffers responsible for negotiating the merger of the two campaigns met for the first time and agreed upon a set of house rules. On 17 December 2012 Korea's two main presidential candidates, Park Geun-hye and Moon Jae-in, squared off in their final TV debate, clashing over welfare, education and crime. Both had similar pledges in regards to providing free childcare and free school lunches. But as for how each of them plan to pay for these programs, Park said she would cut government spending while Moon said he would raise taxes on the rich. Then they touched upon reducing high private education costs by reforming school systems and improving curricula. The National Institute of Korean History was entrusted by the education ministry to put the new Korean History textbook together. However, the opposition bloc strongly resisted the plan. The NPAD's leader Moon Jae-in slammed the government for unilaterally forging ahead with its plan, ignoring what he said is the public's growing demand that the plan be scrapped. Calling the government's move totalitarian, he urged the public to reject the state-issued textbook. He said the party now plans to make use of all legal means available to it, such as filing a constitutional complaint, and for a provisional injunction to stop the education ministry's move. The liberal party was concerned the textbook might be too right-leaning, and gloss over Korea's dictatorial past, while the conservative ruling Saenuri Party argues most current history textbooks are too left-leaning, and their descriptions on North Korea are too lenient and skewed. Moon had been under mounting pressure from non-mainstream factions after the party lost two rounds of by-elections on April 29 and October 28 in 2015. The defeat in the April 13 parliamentary elections had seemed like a determined fact. The miraculous victory in the elections brought a dramatic twist. The New Politics Alliance for Democracy (NPAD) elected Moon Jae-in, 62, as its new chairperson 01 September 2015. Moon was able to rise again for his contributions to the party’s landslide victory in the Seoul metropolitan region and the party’s strong performance in the Busan and Gyeongsangnam-do region. Kim Jong-in’s emergency committee came to an end and a truly pro-Moon party leadership was launched. The opposition party changed its name to the Minjoo Party of Korea -- a move seen to reform its image. Political heavyweight Park Jie-won of the main opposition Minjoo Party of Korea announced his official departure from the party on 22 January 2016, promising more unity in the opposition bloc as a result. The former chief of staff to late President Kim Dae-jung said he will work for cooperation between the People's Party led by Ahn Cheol-soo and the Minjoo Party, without having any party affiliation. Park is de facto leader of a group of lawmakers who have their roots in Jeolla-do Province. They have been denouncing outgoing Minjoo Party chief Moon Jae-in for deepening factional strife between loyalists of late president Roh Moo-hyun and those outside of that faction. When the Minjoo Party split in two after lawmaker Ahn Cheol-soo left the party, Moon gave up control of the party to a former member of the Saenuri Party’s emergency committee. Moon Jae-in stepped down as chairman of the main opposition Minjoo Party 27 January 2016 after the Central Committee of the party appointed Kim Chong-in, who was recruited to head the Minjoo’s general election campaign, as the interim leader. Kim Jong-in seized the reins following the dissolution of the predecessor New Politics Alliance for Democracy (NPAD), and was seen as pushing a security-centered party identity that moved out of the shadow of former President Roh Moo-hyun. The main opposition Minjoo Party of Korea held an in-house primary on 05 August 2016 and whittled down the number of contenders for its leadership post from four to three. Two of the candidates -- Choo Mi-ae and Kim Sang-gon -- have close ties to former party leader Moon Jae-in, who represented the Roh Moo-hyun faction, while Lee Jong-kul did not. If Choo Mi-ae was elected, the party's Moon Jae-in faction will be in the driver's seat as she had close ties with Moon, the former party leader and the man who lost to President Park Geun-hye in late 2012. If she won, it was very likely Moon will make a second run at the presidency. But victories for Kim Sang-kon or Lee Jong-kul, who aren't as close to Moon, will make things much more unpredictable as they would want to take the party in a different direction. At its national convention 28 August 2016, members of the Minjoo Party picked five-term lawmaker Choo Mi-ae as their new chief and elected eight new Supreme Council members, six of whom are considered pro-Moon. Party watchers speculated whether that dominance by his supporters will help the likely presidential candidate Moon in the run-up to the 2017 contest, as unity could help the party achieve stability but could also lead to criticism that it's too dependent on a certain faction. The debate surrounding Terminal High-Altitude Area Defense (THAAD) deployment to rural Seongju County divided the opposition party along factional lines, with those opposed to THAAD’s deployment rallying to the pro-Moon camp, with others seeking alternative positions. Ruling Saenuri Party Floor Leader Chung Jin-suk has criticized main opposition heavyweight Moon Jae-in for proposing a temporary halt to the THAAD deployment process. Chung said at a news conference 10 October 2016 that he was disappointed with Moon’s dismal viewpoints on national security, more so because the former opposition leader is regarded as a promising presidential aspirant. The ruling party floor leader urged Moon to uphold a sense of responsibility as a political heavyweight, saying that suspending the THAAD deployment will only benefit the Kim Jong-un regime. In October 2016 former Foreign Minister Song Min-soon's account of a decision made during the Roh Moo-hyun administration set off a firestorm in domestic politics. The account from his memoir detailed South Korea's decision to abstain from a 2007 vote on a UN resolution on North Korea's human rights record. According to Song, Moon Jae-in, who was the chief of staff to the late president at the time, proposed that South Korea ask for North Korea's opinion on the matter before voting. In the end, Seoul abstained from voting. Moon Jae-in, former chairman of the main opposition Minjoo Party and one of major presidential hopefuls, told reporters 15 November 2016 that he will initiate a nationwide campaign to let President Park step down, saying the campaign will last until the president declares her unconditional resignation. Moon said people's frustration, shown in Saturday's mass rally, cannot be cured only by Park's resignation, noting it is high time to replace the current era and overhaul the root of the country. Over a million South Koreans took to the streets in Seoul alone in the third weekend rally to demand Park step down. Speaking to journalists at the Seoul Foreign Correspondents Club on 15 December 2016, Moon Jae-in, a leader of the Democratic Party, South Korea’s leading opposition party, said it would be his “great honor” to run as a candidate in the next presidential election. Moon led the field of likely South Korean presidential candidates with a 24 percent approval rating, compared to current UN Secretary-General Ban Ki-moon who is second in the polls with a 19.5 percent rating. Moon said he would meet with North Korean leader Kim Jong Un, if it was agreed that the nuclear issue would be on the agenda, and that he would support a deal to freeze the North’s current nuclear capabilities, with the understanding that dismantling the nuclear program is the long term goal. Moon would to revive a limited version of the past Sunshine Policy of Engagement that in the early 2000s tried to build trust with North Korea through investment, exchanges and aid programs, while also maintaining strong deterrence and international sanctions. “We need to have two tracks of measures here. We need to be able to apply some pressure and coercion on North Korea, but on the other hand we should also start discussions and dialogue with North Korea,” said Moon. Moon said he would support some deal to put in place a temporary freeze on the North Korean nuclear program that might lead down the road to further disarmament talks. His support for inter-Korean dialogue could put the South Korean leader at odds with the Trump administration in Washington, which has rejected a similar freeze plan suggested by the leadership in Beijing. On relations with Japan, Moon wants to renegotiate the 2015 “Comfort Women” deal in which Prime Minister Shinzo Abe offered “apologies and remorse” for the thousands of Korean women who were forced into prostitution by the Japanese military during both WWII and Japan’s colonization of Asia. Tokyo also agreed to donate more than $8 million to the surviving Korean victims. Some of the surviving Comfort Women and supporters in South Korea denounced the apology as informal and insufficient, and rejected informal donation instead of formal compensation for war crimes. “What Japan needs to do in regards to Comfort Women issues is to recognize fully it’s legal responsibility and make an official apology. We don’t need money,” he said. While he has voiced strong support for the US alliance, Moon also said South Korea should learn to say ‘No’ to the Americans. He has not directly opposed the US THAAD anti-missile shield being deployed in South Korea, but has said it should be postponed until after the election, so the next president can better evaluate its diplomatic risk versus security benefit, and to better alleviate the concerns of China.